The Krome Processing Center opened in 1980 to house the more than 100,000 migrants who arrived in the U.S from Haiti and Cuba. The Center now detains immigrants from over 30 countries. In this Mass Story Lab, we hear the stories of people detained at Krome over the last 35 years and others impacted by incarceration in South Florida. 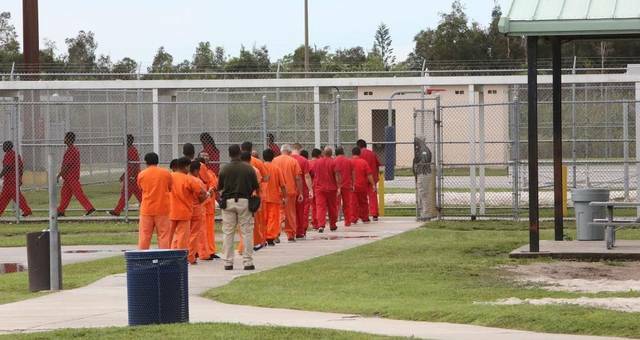 How does the experience of detention impact a sense of community and belonging in Miami? In thepresent political moment, what can we all do to protect those seeking sanctuary in the U.S? Hosted in conjunction with "States of Incarceration: A National Dialogue on Local Histories". About Mass Story Lab: Mass Story Lab travels to communities across the U.S providing a model for participatory storytelling that promotes community building, creativity, and justice. Each community choses a theme for their interactive lab. Sponsored by University of Miami Office of Civic and Community Engagement and the Humanities Action Lab.